This is, properly, an Irish machine. The jaunting car is almost peculiar to our island. 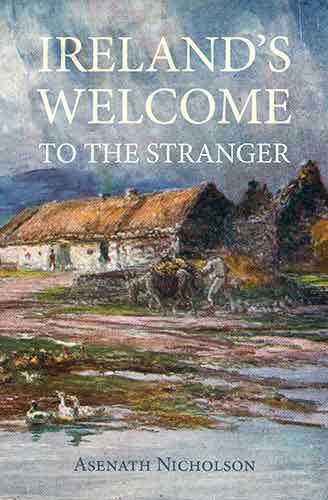 A. Scotchman or an Englishman on first landing at Dublin or at Kingstown is struck with this peculiarity; but: they soon learn to relish so agreeable and handsome a conveyance. It is true, that the cars for hire do not present very great temptations: the miserable horses, and too often the squalid, dirty drivers, clamoring for a fare, and underbidding each other with fierce vociferation, while the furious driving, and incessant attempts to take advantage of ignorance and inexperience, render the Dublin carmen almost intolerable, (we speak generally) except to those who are content to endure these disadvantages for the pleasure and ease of being conveyed to any part of the city or country. But none who have enjoyed the comforts of that pleasant vehicle, a private car, will quarrel with our designating it agreeable and handsome. Almost every citizen who can afford it, (and we are sorry to add, many who can not,) keeps a car. In a future number we will give an excursion to Kingstown - but in the meantime conclude our notice with the following extract kindly furnished by a friend. 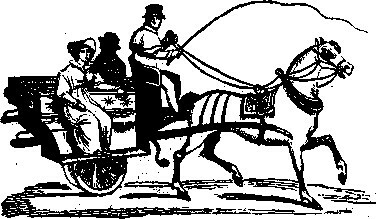 "'They have an odd kind of machine here, which they call the noddy; it is nothing more than an old cast off one-horse chaise or chair; with a kind of stool fixed upon the shafts just before the seat, on which the driver sits, just over the horse, and drives you from one part of the town to another, at stated rates for a 'set-down,' and a good set-down it is sometimes, for you are well off if you are not set down in a channel, by the breaking of the wheels, or an overset-down; nor can you see any thing before you but your nod, nod, nodding charioteer, whose situation on the shafts obliges his motion to be conformed to that of the horse, from whence I suppose they have obtained the name of the Noddy. I assure you the ease of the fare is not much consulted in the construction of these nodding vehicles. But the drollest and most diverting kind of conveyance for your genteel and ungenteel parties of pleasure is what they call here the Chaise-marine, which is nothing less or more than any common car with one horse. A simple kind of carriage constructed with a pair of wheels, or thin round blocks, of about twenty inches in diameter, an axle and two shafts, which over the axle are spread out a little wider than the sides of the horse, and framed together with cross pieces in such a manner as to be nearly in a level position for three or four feet across the axle. These simple constructions are almost the only kind of carts in common use for the carrying or moving of goods, merchandize of every kind, hay, corn, &c. through the kingdom. These are however used for parties of pleasure, when on the level part a mat is laid for the commonalty, and for the genteeler sort of people a bed is put on this, and half a dozen get on, two behind, and two on each side, and away they drive, with their feet not above six inches from the ground as they sit, on little jaunts of a few miles out of town; and they are the most sociable carriages in use, for ten or a dozen will take one of these Chaise-marines, and ride it by turns, the rate being seldom, in such cases, more than a foot pace. I assure you they are the drollest, merriest curricles you ever saw. We were infinitely diverted at meeting many of these feather bed chaise-marine parties on the Sunday we landed coming out of town, as we went up to it from Dunleary.' Such was the jaunting car of Ireland in 1764, and could the honest gentleman to whom we are indebted for this description "revisit the glimpses of the moon," and see the vehicle of 1832, how great would be his praises and surprise. I shall take an early opportunity of returning to his pages, from whence I have no fear of being enabled to extract much that will be found agreeable, useful, and entertaining."